5 Benefits that Water Features provide to your landscape. 1. They bring the sounds of nature to your doorstep. You work long hours, and it's not often possible to get away from it all and enjoy nature's soothing sounds. In this case, bring nature to you. With today's technology and a clever plan designed just for your property, the soothing sounds of nature can be just outside your doorstep. Imagine coming home from work, dropping your papers at the door, and wandering around to the patio table next to your water feature. The stressful day can melt away as you listen to the cascading water washing away your workday cares. But the sounds of nature aren't the only benefit of your water feature. 2. They will attract natural wildlife and enhance your local ecosystem. As soon as your water feature is installed, you'll begin to notice an increase in wildlife on your property. Birds will visit, and dragonflies will dart around. Instead of a barren span of horizontal land, your yard will become a haven for beneficial wildlife. Inviting wildlife onto your property provides endless hours of entertainment and educational opportunities for you and your family. All living creatures need water to survive, so you'll be supporting life in your little corner of the world. The plants you include in your landscaping plan, along with your water features, bring your property into harmony with the habitat around you. 3. They can be adapted to fit smaller spaces. 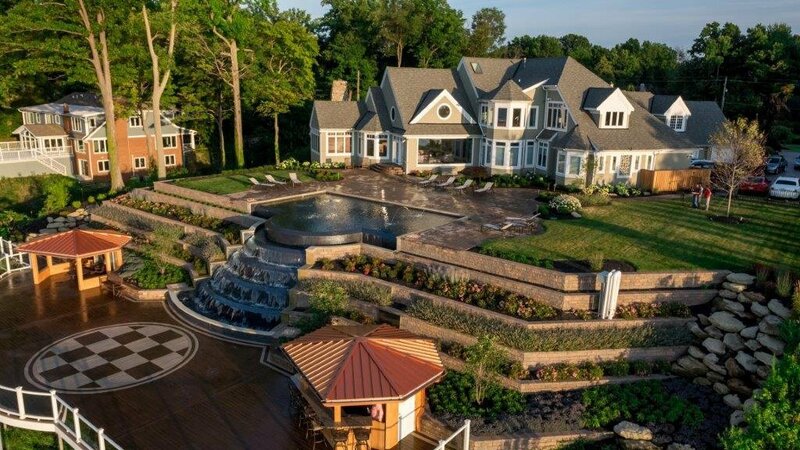 Don't automatically dismiss the idea of including water features in your landscaping design just because you have a small yard. 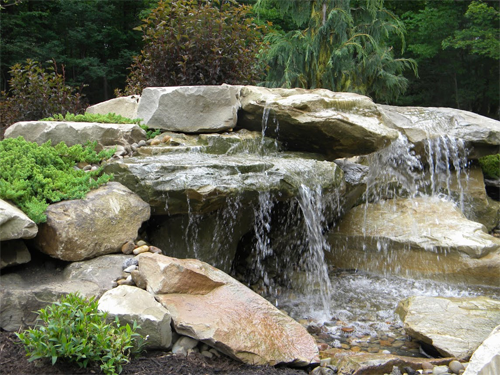 Well-designed pondless water elements don't require much space, so you can still enjoy the sound of water and the increased wildlife without taking up much of your precious land. A water feature can be tucked into an area of your property that previously seemed a waste of space. Often, awkward spaces are the best places to put small water features; you can turn an ill-used area into a beautiful focal point. 4. They require very little maintenance. Unlike swimming pools, which require vigilant monitoring, pondless water features can supply you with texture, natural sounds, and visual interest without much effort at all. Simple wall fountains, huge cascading waterfalls, and other pondless water features are great choices if you don't want to deal with much maintenance. The water in these features essentially re-circulates, so they don't use much water and or grow much bacteria. Pondless water features are also great for families with young children because they don't pose safety risks. 5. They give you an opportunity to make your landscaping one-of-a-kind. When you design a water feature for your yard, you get a chance to make your home truly unique. Everything about your water feature can be specially designed for your space. For instance, rocks can be hand carved to create beautiful flowing water elements and falls. If you'd like to enjoy the soothing sounds of nature, invite wildlife onto your property, and fill your space with a low-maintenance, one-of-a-kind landscaping element, talk to us about including a water feature in your landscaping.